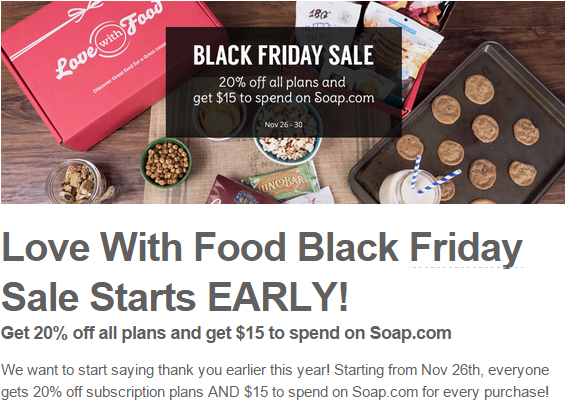 Black Friday Deals for November 26th- Julep, Bean Box and More! Bean Box- 20% off with code Thankful until December 2nd. I'm currently getting Bean Box and their coffee is really excellent. They make great choices when deciding which roasters to include in each box. You can see my review of Bean Box here. Bean Box is on a mission to bring warm, caffeinated joy, the occasional surprise, and the best artisan coffee experience available to every customers with each Bean Box delivery. Seattle is the epicenter for locally-roasted, authentic coffee. You can’t go a mile without finding a coffee shop that treats a cup of coffee like a form of art. The presentation, aroma, and taste combine to create a unique experience worth sharing (okay, addiction!). Why not make it easy for everyone to experience the never-ending variety of Seattle’s most revered coffee shops and roasters? The Bean Box was born. Julep: Use code RUMELOVE to get a free tote with any $10 order. You do not have to be a subscriber to purchase from the Julep shop! If you do want to become a Maven, you can get your first box free with the code FREEBOX or get the Holiday Collection free with the code FROSTY. In either case, a free tote for only spending $10 is a pretty fun deal! Wondering what to get the men in your life?! I have the solution! Well, if they like meat, anyway. Stick in the Box has a special gift subscription available right now! They're calling it Carnivore's Rejoice. It's two months of jerky and meat goodness for $60 (normally it's $35/month) and you can get it for only $50 with code IAMSPECIAL (which gives you $10 off). Sign up now and the subscription will start in December and continue to January. I seriously love my Stick in a Box boxes! You can see one of my reviews here. Today through Sunday (or while supplies last), use coupon code BLACKFRIDAY14 to get the Artisan Entertaining box free when you sign up for a Hamptons Lane subscription starting with the American Breakfast box. Get 15% off all Bestowed Gifts!! Use code BFCM15. Bestowed is a monthly assortment of the best healthy food, snacks, beverages and lifestyle products on the market. They send organic and natural snacks along with other fun things like soaps, food savers and great coupons. Check them out here.